VACATION YEAR ROUND - COLUMBIA RIVER FRONT COMMUNITY! Quiet development w-1/2ac lots, tucked away on a peninsula w-river ftg/beach. Stunning custom built home w-extras & windows galore. Engineered hardwoods through out. 1120 SF of wrap around decking to enjoy the million dollar views! Bonus room in lower level behind garage with hot tub and endless storage. Two on demand water heaters. High wind rated composition roof. Tempered glass double paned windows for heating and cooling efficiency. Plus the home boasts an intercom/radio system for easy communication between floors. There’s two dining areas.. one in the kitchen with the river views. 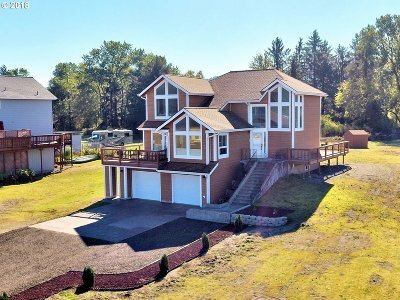 A second in the large family room on the rear that has two sliders opening to the deck and your .46 acre back yard. The home is located right across from the community’s park/playground, with the sandy Columbia River beach access just footsteps away. If you’re a boating and fishing enthusiast, the community has a private boat launch ramp in to the slough. Fish the quieter slough waters that wind around the Clatskanie areas, or motor right out in to the Columbia River. If you’re a wind surfing fan, one of Oregon’s best wind surfing sites – Jones Beach – is just 3.4 miles down the road along the river. Make your way to Astoria to the west in about 45 minutes, or all the way Seaside on the Pacific Ocean in about one hour. Paradise on earth awaits… what could be more perfect than living the vacation/recreational dream year round?